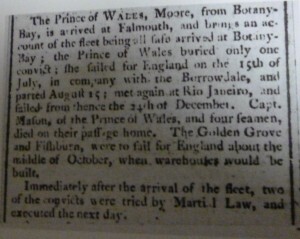 Prince of Wales was added to the number of transports in December 1786, on representation being made to the Treasury Board, that such an addition was necessary to carry female convicts to Botany Bay. With its royal name Prince of Wales was one of the newest vessels in the fleet, having been built on the Thames by Christopher Watson & Co and launched on 12 August 1786 for its owner James Mather, a Cornhill merchant. Prince of Wales afully rigged shipwas 350 tons, 103 feet long and 29 feet wide. The vessel had a poop deck, quarter galleries – that is, projecting covered balconies on either side of the ship toward the stern, probably covered balconies on either side of the ship toward the stern, probably decorated with small pilasters framing a single tier of windows – and a fiddle head, a scroll which curved upwards and outwards. 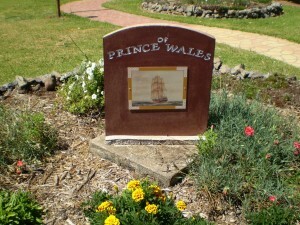 For the voyage to Botany Bay, Prince of Wales was under the command of Master John Mason. 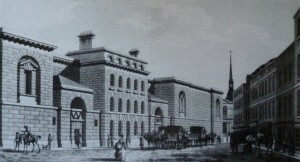 Prisoners were taken aboard at Portsmouth in March – still winter in the north – two women were sent from Chester jail, followed by four women and a child from Lincoln. When the Prince of Wales sailed there were 49 female convicts and 1 male convict George Youngson, who embarked with his sister Elizabeth Youngson, just as the Fleet was readying to sail. Rebecca Bolton’s daughter Rebecca was born in Lincoln Gaol. To keep mother and child together, permission was granted by the authorities upon a letter received from a gaoler in Spilsby, Lincolnshire. Both survived the voyage, but later died, and were buried at Sydney Cove in the April of 1788. James Parfett, son of Marine drummer John Parfett and his wife Sarah was born on the Prince of Wales and baptised at Teneriffe. Thomas Harmsworth Marine, made the voyage with his wife Alice, daughter Ann and son John. Another son Thomas was born on the voyage in December 1787, but died shortly before his father at Port Jackson. The only civilian aboard was Augustus Theodore Henry Alt who had been appointed surveyor of lands for the NSW colony. He acted also as magistrate and member of the vice admiralty court and went with Phillip in November 1788 to establish the settlement at Rose Hill (Parramatta). His nephew Matthew Bowles Alt joined Sirius as a midshipman. With her sister ships, Prince of Wales departed Portsmouth on Sunday 13 May at 3am and by 10am the fleet had cleared the Isle of Wight – the long journey was in front of them. At the Cape of Good Hope, Private Marine Henry Wright and his family were transferred from Sirius along with Private Marine John and wife Susannah Turner. A number of convict women were transferred from Friendship also at the Cape of Good Hope to Prince of Wales, Lady Penrhyn and Charlotte to make way for live stock and provisions. The ships sailed from Cape of Good Hope on the 12 November, on the 23rd the Prince of Wales log recorded Yorgan Yourginson fell overboard, from the maintopsail yard, the ship having such quick way through the water that it was impossible to save him. Did not hoist out a boat. Phillip handed over command of the convoy to Captain Hunter on the 25th but instructed the faster sailing transports Alexander, Scarborough and Friendship to make their best speed under Lieutenant Shortland. Phillip transferred to Supply. All the ships reached Botany Bay by Sunday 20 January 1788. White expressed the general feeling of pleasure and relief in these terms: To see all the ships safe in their destined port without having, by any accident, been one hour separated; and all the people in good health as could be expected or hoped for after so long a voyage, was a sight truly pleasing, and at which every heart must rejoice. 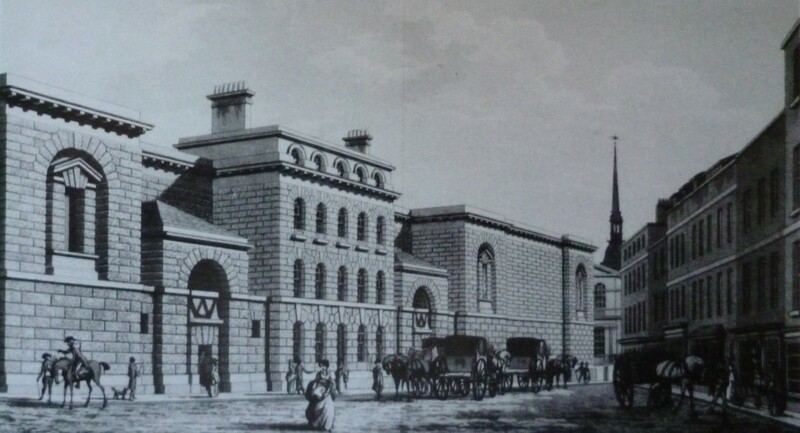 On 5 February, Mr Miller the commissary, Mr Shortland the agent, and Mr Freeman the Commissary’s clerk visited the Prince of Wales and Lady Penrhyn and issued clothes to the convicts. Bowes recorded that they issued out slops of every kind to all the women and children on board, previous to their landing tomorrow. He also described their landing on Wednesday 6February: At five o’clock this morning, all things were got in order for landing the whole of the women. 62 female convicts and 3 children and 2 male convicts were landed from the Prince of Wales. By the 18 May Prince of Wales was cleared of all its stores. Bradley noted that the Governor made known his intention of sending the Prince of Wales transport to England. Mr Johnson added a postscript to his letter to Mr Stonard about the expected departure of the vessel. Prince of Wales under the command of Master John Mason departed Sydney Cove in company with Alexander, Borrowdale and Friendship. 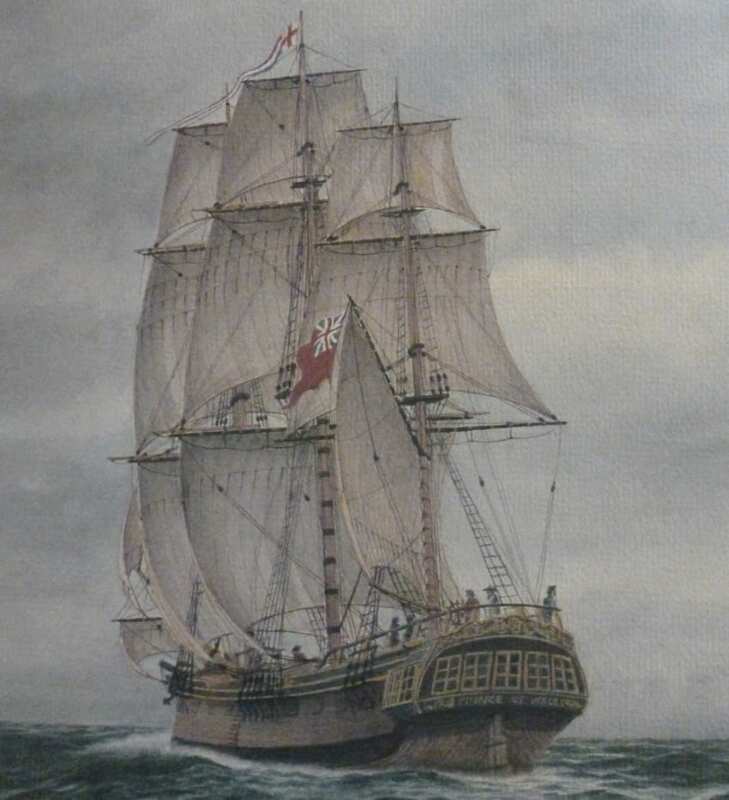 Bradley noted on 14 July: The Alexander, Prince of Wales, Borrowdale & Friendship transports sailed for England under the direction & command of Lieut Shortland, Agent for Transports. These ships were all in a distressed state when they sailed, both as to sickness, want of provisions & furniture. Alexander and Friendship parted company with Prince of Wales and Borrowdale off Port Stephens. The two ships sailed together until they lost company on 15 August. 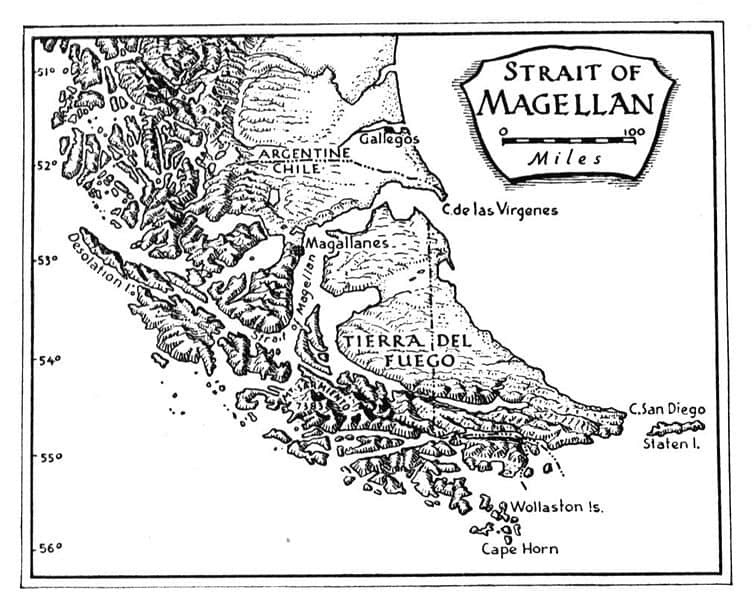 Prince of Wales continued her course through the South Pacific Ocean, passing through the Strait of Magellan, a 350-mile navigable passage between the Pacific and Atlantic oceans located at the southern extremity of South America. 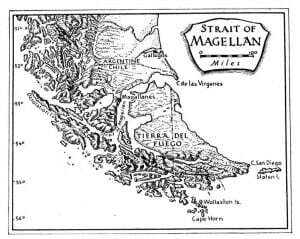 It separates the mainland of Patagonia from the archipelago of Tierra del Fuego, the eastern part of which today belongs to Argentina, the western and southern parts, including Cape Horn and its surrounding islands, to Chile. But there is nothing straight, nor straightforward about the passage; rather, it is a maze of islands, bays, and channels. Once in the South Atlantic Ocean and with the men in great distress owing to scurvy, it was thought advisable to continue to Rio de Janeiro Brazil, for provisions. Scurvy was often known as the Sailors disease because of its prevalence amongst sailors on long sea voyages. However, it can occur whenever there is a shortage of fresh fruit and vegetables. Basically it is caused by a deficiency of Vitamin C or ascorbic acid and has terrible symptoms. Sailors with scurvy were confined to their bunks and many became so debilitated that they died. Seaman’s Mate Samuel Moore had taken over the command of Prince of Wales when the Master, John Mason took ill with scurvy. Upon his death on 9 October, Moore became Master of the vessel for the remainder of the voyage. Burial at sea is the most natural means of disposing of a body from a ship. It is custom to sew the body into a hammock or other piece of canvass with added heavy weights. As Master of the ship, Mason’s body would have been sown in sailcloth and placed on a litter board over which the union flag was draped. Following a prayer service by the commanding officer, the litter would have been titled to enable the body to slip silently over the side of the ship into the sea. Prince of Wales arrived at Rio on 14 October with a crew so debilitated by scurvy, and incapable of duty, that port officers had to board the vessel and bring her to anchor safely in the harbour. Seamen Joseph Richardson and William Rogers spent time recuperating in the Rio hospital. Borrowdale travelled the same route as Prince of Wales, her crew suffering a similar fate. The Rio Harbor Master boarded the vessel on 6 November and bought her to a safe anchorage in the harbour. Three of the seventeen crew members were free of scurvy. Those severely afflicted with scurvy were sent to the Rio hospital. 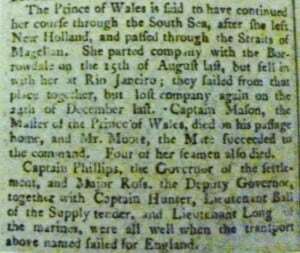 Borrowdale and Prince of Wales departed Rio together, but lost company again on 24 December. 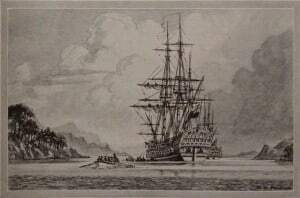 Prince of Wales eventually reached Falmouth England on 22 March 1789. News reached the public on her voyage, and the loss of the Master and four seamen. Prince of Wales docked in Deptford on 30 April. The vessel operated around England until 1797 when her registration was transferred to Fort Royal, Martinique, after which, little is known.